Stephon Alexander is a professor of physics at Brown University and the winner of the 2013 American Physical Society Edward A. Bouchet Award. He is also a jazz musician and released his first electronic jazz album with Erin Rioux. Alexander lives in Providence, Rhode Island. "I'll forever be grateful to musician/physicist Stephon Alexander.... He'll help you see how our awe-inspiring universe is on a never-ending, cosmological riff. "—Felix Contreras, NPR, "Best Books of 2016"
"Interwoven with solid physics and personal anecdotes, the book does an admirable job of bringing together modern jazz and modern physics. 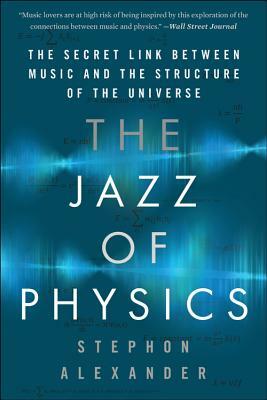 "—Physics World, Shortlisted for "Book of the Year (2016)"
"In the most engaging chapters of this book -- part memoir, part history of science, part physics popularization and part jazz lesson -- Dr. Alexander ventures far out onto the cutting edge of modern cosmology, presenting a compelling case for vibration and resonance being at the heart of the physical structure we find around us, from the smallest particle of matter to the largest clusters of galaxies.... His report on the state of research into the structure and history of the universe -- his own academic field -- makes for compelling reading, as does his life story."